Acucraft Fireplaces offers 13 standard wood burning fireplace models, including both single sided and see through. We have spent over 35 years designing and adding to our select list of standard models. Each model is unique and offers different benefits. 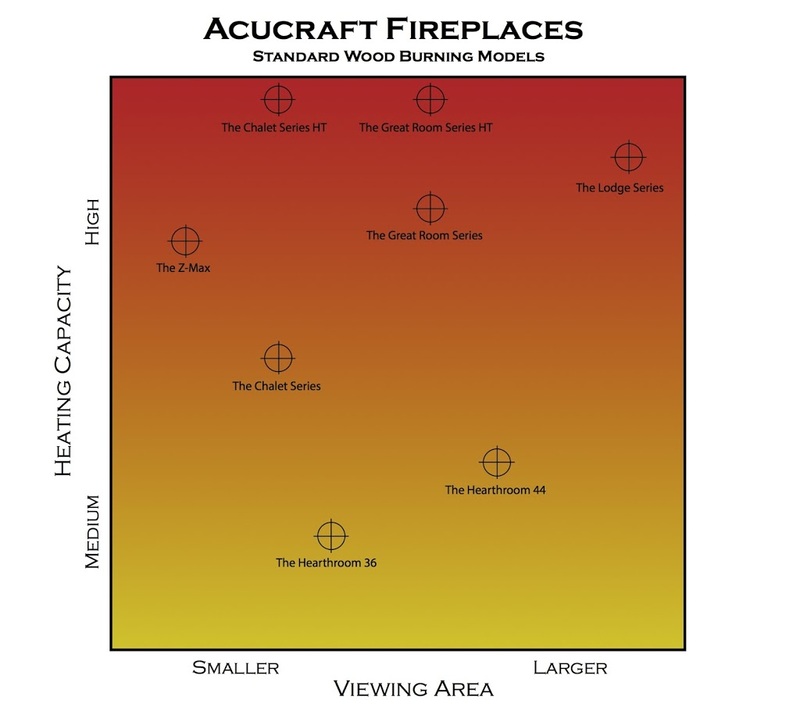 Acucraft Fireplace Selection Specialists work directly with you to identify your needs and wants and ultimately, help you determine which wood burning fireplace is best for you. Whether you are looking for a large viewing area or a small one, a see through or single sided, arched doors or rectangular doors, insulated panel (zero clearance) or masonry, a fireplace to heat a single room or 4,000 square feet, Acucraft has a standard model to suit all your wood burning needs. 1. 7 gauge steel firebox, double welded inside and out. – A high temp mineral wool insulation that absorbs 1200° F of heat per inch of insulation. We use 4 inches for the top cap. – Supplement other hot water heating systems like radiant floor heat, base board heat and domestic hot water heaters. Each specific fireplace model offers different benefits, so whether you’re looking to heat your cabin during the freezing cold winters or provide a focal point without adding much heat—Acucraft likely offers a standard fireplace to fit your needs. – Perfect if you need a lot of heat but don’t want to take up a lot of space. — We also offer a “High-Tech” version of the Chalet Series and the Great Room Series fireplaces. Above is a Hearthroom 44 See Through fireplace with rectangular doors. Every fireplace, other than the Z-MAX, is available with the see through option and rectangular or arched doors. With a see through fireplace, no performance is lost—the fireplace can still heat the same amount of space and the BTU’s/Hr remain the same. This option allows direct heat to be transferred to two different rooms or provide a partial break within the same room (as seen in the photos above) and can even be installed as an indoor outdoor system (pictured below). 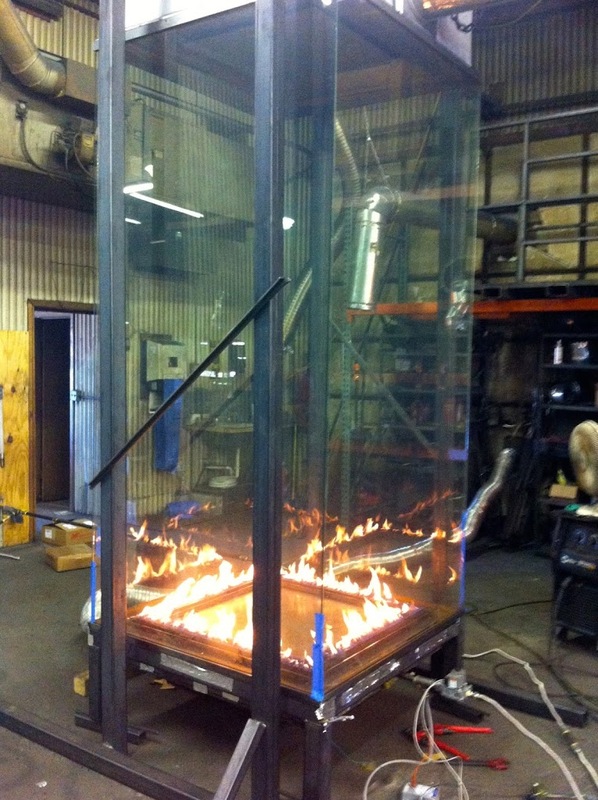 Take a look at our post on Indoor Outdoor See-Through Fireplaces. 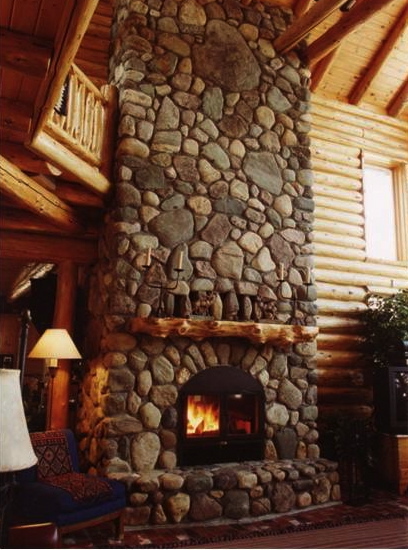 Learn more about each of our standard wood fireplaces on our website. Contact Acucraft to speak with your Wood Burning Fireplace Advisor and determine which wood burning fireplace will be best for you. And if none of our standard fireplaces are perfect for you, Acucraft offers custom wood fireplaces to make your dream fireplace a reality. You dream it, we build it.